You’ve seen Bill and Martha on television before. They are political pundits akin to James Carville and Mary Matalin with their own local television show. When they break a news story about a potential situation in a Russian puppet state their show goes national. Unfortunately for them, their juicy story may result in their daughter Sally being held for undetermined length by the US government. 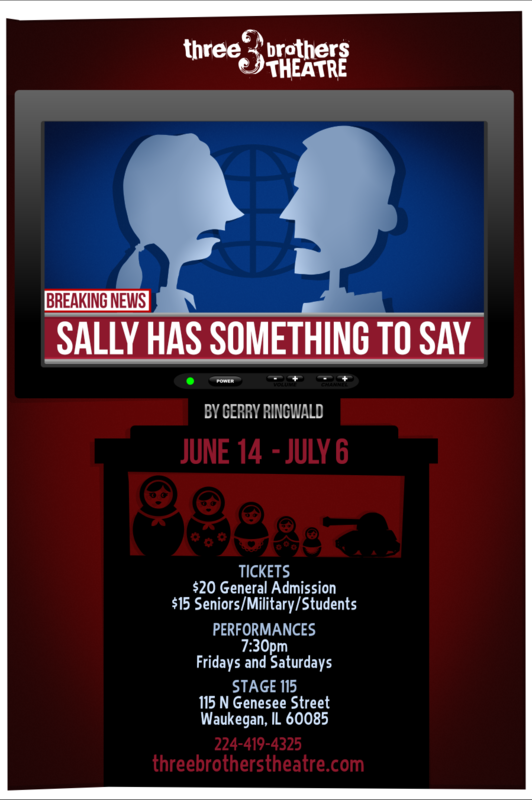 Sally Has Something to Say takes a delightful look at our fascination with divided politics in our increasingly digital world. Gerry Ringwald is a professional writer based in Chicago. He has been a professional screenwriter and playwright since 1991. Born in New York, Gerry graduated with a B.A. in Theater from the University of Buffalo in 1978. He moved to Los Angeles ten years later to pursue a career in motion picture marketing and screenwriting. After 20 years of boring endless sunshine, Gerry and his wife moved to Chicago in 2008. Gerry was a Network Playwright at Chicago Dramatists from 2011 to 2016 and been a resident playwright with the La Strada Ensemble Theater in New Jersey since 2015. In 2018, he was also graciously invited to participate in 3 Brothers Theatre’s Playwright Residency Program. Since 2008, Gerry has written six full-length plays and over a dozen short plays. His full-length play, “Not Curing Cancer,” which was a semifinalist in the Eugene O’Neill Theater Center’s 2014 National Playwrights Conference, and many of his short plays have been produced on both coasts and the Midwest over the last decade.